Next Generation Ministries: When Dreams Come True! Ever had a dream that was so good that you wished it was a part of your actual conscious world? Rather than that brief moment during your unconscious moment of sleep? I suspect that most of us have had dreams that come and go and never seem to be related to the reality of our lives. Often they are simply disappearing memories when we wake up. There are some dreams that live in our waking moments. A contrasting characteristic in Third World Countries is limited options. People often have living dreams ... and they are only considered dreams because they are the kind that seem impossible. This post is about one such dream that came true. Some might call it an accident. Or a chance meeting. Or dumb luck. Or ... maybe just the next chapter in a miracle that God was working for one of His own. Here is how it all began. In February, of 2013, I was in Kampala with a friend who was shopping for a flat screen TV. We had been to the two largest outlets malls in Kampala and found them pretty expensive. But someone told us that we should leave those places and go downtown and look. He promised that we would find the same products, but much cheaper, at some of the shops run by Indians. Thinking we had nothing to lose, though it was already dark, we headed toward Watoto Church and the numerous electronic shops that line both sides of the Jinja/Kampala Road. We discovered that most of the shops were closed and locked up. One, however, More Electronics, was committed to staying open until 9 PM. My friend was all about finding the TV he was looking for as we entered the shop. I am usually all about people and this night was no different. I discovered two young girls working as sales people at the entrance. They immediately turned my friend over to their boss. It was near closing time and they were more interested in walking away from a long and tiresome day of work. I was interested in connecting with them and discovering if either had a relationship with Jesus. Esther was easy to speak with. Rebecca was distant, closed, and wore sadness like an old overcoat. She put on a smile, but she was only pretending. She had no interest in a casual or otherwise conversation. Not one to be easily pushed aside, I looked this sad young girl in the eye and asked her if she was fine. She said, "Yes." Her response said one thing while her countenance communicated the opposite. I told her, "I don't think so." She looked away. I asked, "Who hurt you? I don't think you are fine. I think you are wounded. I wish we had a relationship. I think I could help you get healed from those wounds." I even told her that if I was her father I imagined the healing and happiness we could bring into her life. A big tear formed at the corner of her eye and began to run down her cheek. She got up from her stool, went outside, walked down the street, and disappeared around the corner. Her response, all of it, caught me off guard. I pleaded with Esther, "Please tell your friend that I never meant any harm. Tell her that I am going to come back to Kampala and bring my wife and granddaughter with me. Tell her that we care about her." That was the beginning. When I returned with my wife, Pam, and our granddaughter, Robyn, our relationship began to grow. We invited her to come to Jinja and share Easter. Eventually, Rebecca left that job and came to live with us for a brief time before we returned to the United States in 2013. While we were in America for that summer, Rebecca stayed with some Ugandan friends of ours who also hosted a young lady from Salem, Oregon. When Pam and I returned to Uganda on October 2, 2013, Rebecca and a few other young adults welcomed us back to Uganda. Soon some of them were living in our house and we began mentoring them. Life as she had know it was disappearing rapidly. These family like experiences were so new to Rebecca. They resembled nothing in Rebecca's previous life. She has never had a memory of either parent. At the age of 10 she was taken by a cruel auntie from a village woman who loved and cared for her. For the next 8 years she was the virtual slave of this woman. Some may think that this woman paid Rebecca's school fees, but my opinion is that Rebecca earned every shilling spent on her for education and upkeep. It was a terrible time in Rebecca's life. And, those were the wounds that I suspected were on Rebecca's soul. In a new environment, Rebecca began to enjoy the goodness of Jesus plus a pretty good family life. She began to give up the tendency to control her life (which is what most wounded people attempt) and trust Jesus. Life began to change. A dream began to emerge. Pam and I began to help Rebecca begin a search of what she would like to do with her life to bring glory to God. She indicated an healthy interest in the medical profession. She had excellent grades (being both intelligent and disciplined), but had failed to take biology in her advanced level of Secondary School. Every nursing institution we investigated refused to accept Rebecca as a student simply and only because biology was missing. And, to increase the level of frustration, in order to be admitted for nursing training, Rebecca would be required to go back and repeat those two years of secondary education ... just to get her biology! Rebecca gladly took the opportunity to work with some medical teams who came to assist Next Generation Ministries in Uganda. She and the medical professionals began to notice her aptitude and interest in medicine. Talk always turned to getting Rebecca an educational background that would allow her to benefit the medically needy. The only door that seemed to be open was the one that lead to Rebecca being an international student. That was such a discouraging option for me. I have this intense impression that the U.S. Embassy in Kampala specializes in handing out disappointment. They are VERY stingy with visas. More than anyone Rebecca loves her mother! But, dreams can come true. 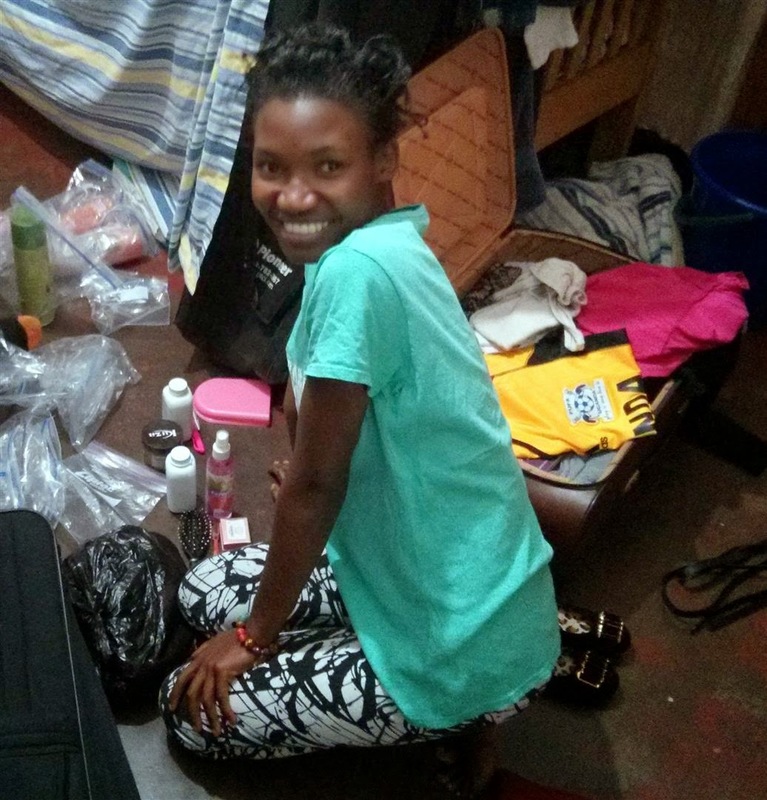 A small team began to share responsibility to pursue Rebecca's dream of studying in America. We worked for months under the radar for cultural reasons. Dr. Brian and Maren Synders of Coure d'Alene, Idaho, did a medical mission with Next Generation Ministries in March of 2014. They were impressed, like previous medical professionals, with Rebecca's aptitude. Maren began to think maybe they could do something about Rebecca's need for education ... in America. In Idaho ... in their home town ... where there was a college. My history of disappointment in getting visas from the Embassy countered any hope that I might have had. Those short term missionaries who have met Rebecca understand that she is a person worthy of investment. She has no family other than her adopted parents, the Hunters. She has a few biological relatives, but her real family is made up of people who are associated with Next Generation Ministries. All of us need to do whatever we can to sponsor this student. The dream will live on as we participate in paying for her college education. This is the first time that Next Generation Ministries has designated a student sponsorship. Student sponsorships are not a part of our core vision. Our core vision is to encourage, equip, and empower the next generation Ugandans. But, when the encourage, equipping, and empowering requires a college education, it is time for us to become sponsors. 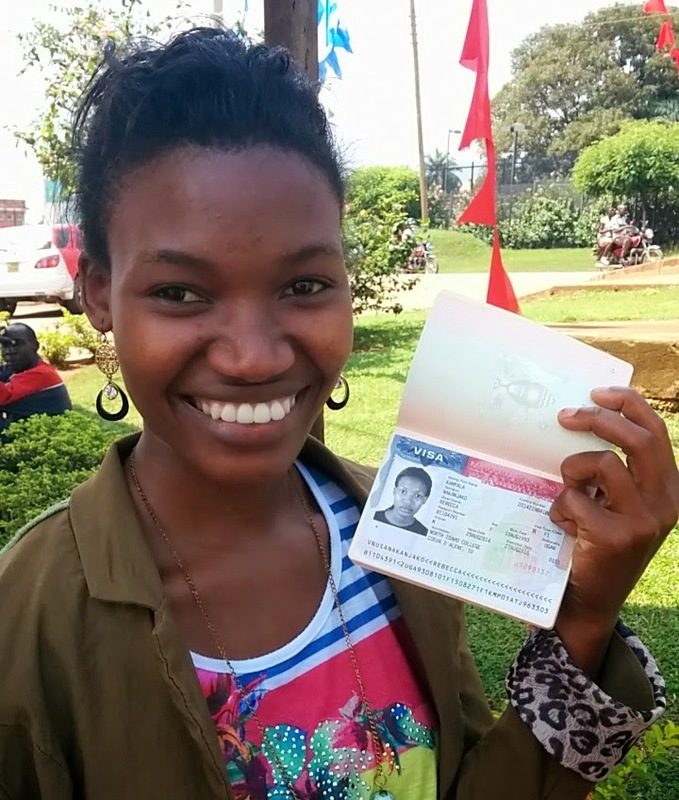 Rebecca is not the same sad and lost person I met in Kampala 18 months ago. She now has a genuine and intimate relationship with Jesus Christ. She knows who she is and whose she is. She has seen wound after wound healed. She has experience new freedoms, one after another. She has witnessed and experienced love like never before. She now has a family. She has a vision and that vision is more than a mere dream. It is becoming a reality. Would you like to be a part of Rebecca's Dream? This has been a journey of faith for Rebecca and all of us who have been working to see her study medicine. For cultural reasons, we had to wait until Rebecca's visa was in hand, and she was ready to board her plane, before we shared the financial part of the dream. Rebecca's tuition and fees will approximately be $4,000 per semester or $8,000 annually. The size of your contribution does not matter. What matters is becoming a part of something bigger than yourself ... a part of Rebecca's story ... a part of Gods' story. Please send your check or money order to Next Generation Ministries and mail it to 29940 South Dhooghe Road, Colton, OR 97017. Make sure you write Rebecca's Dream on the memo line. OR ... you can simply click on the DONATE button on this page to the right of this post to make an electronic donation. However you donate you will be come an official member of REBECCA'S DREAM TEAM when NGM receives your contribution. YOU ARE BLESSED BEYOND MEASURE, YOU WILL BE A BEACON OF HOPE WHERE EVER YOU WILL GO. YOUNG LION, ROAR, MISS YOU LITTLE SIS. LOVE YOU, WILL ALWAYS LOVE YOU, Distance can never take you away. Dedication Song is, Destiny by Lillian Bulamu. Is Lillian's song on our webpage Ezra? Do you think it should be if it is not? Uplaoding it in a few hours from now. Congratulations Rebecca !! 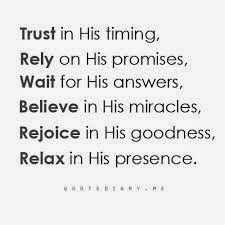 I'm thrilled to hear what God is doing in and through your life. I consider it a miracle too, Jolly! My friend was all about finding the TV he was looking for as we entered the shop. I am usually all about people and this night was no different. And HE used that special trait in an amazing way. Loved reading this story, and happy first day of school to Rebecca! I never tire in the discovery of God's ways to connect people to people in significant ways that glorify Him and bless them!